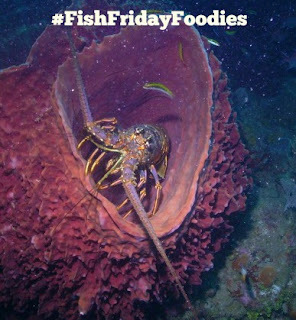 This month's Fish Friday Foodies' event is 'Pan or Deep Fried Fish' chosen by April of Angels Home Sweet Homestead. Thanks April for choosing this theme. 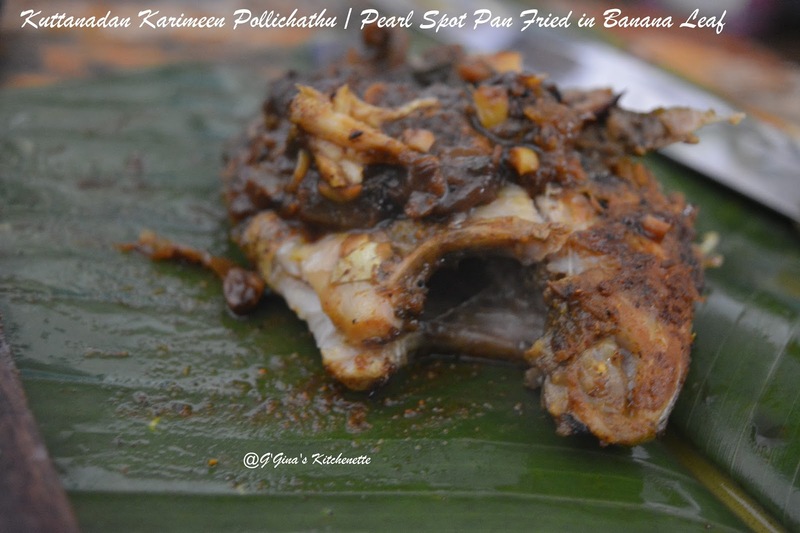 I have always wanted to make the Pearl spot in our traditional Keralite manner. 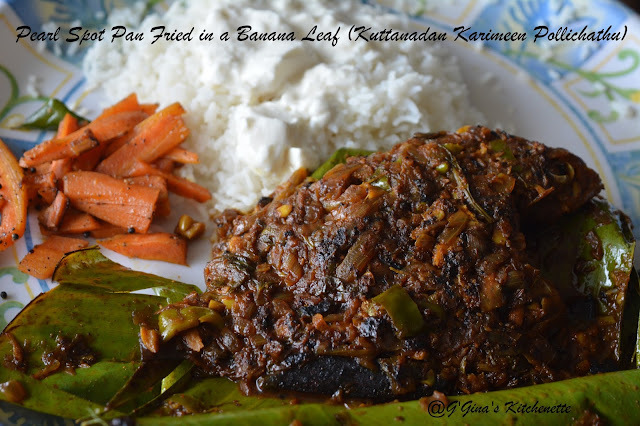 It tastes awesome and is packed with flavour. Not only that it takes very little oil/fat to make it. 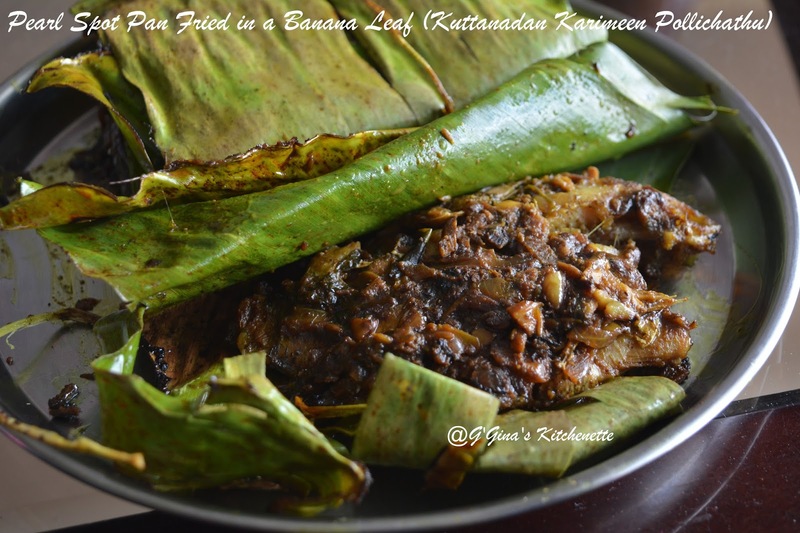 I tried the traditional Kuttanadan recipe. Read more about the Kuttanad region of Kerala (India) here. Pearl spot is called 'Karimeen' in Kerala and 'Pollichathu' essentially means burnt (in literal terms)/grilled/ pan fried in a Banana leaf. 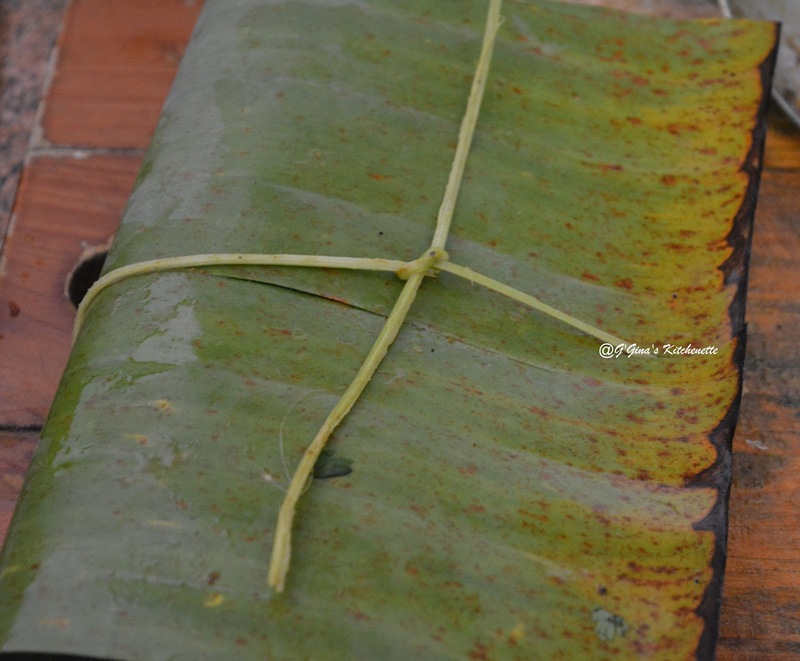 The fish is cleaned and wrapped in whole in the leaf. This batch of extremely fresh Pearl Spot fish was procured through a good friend Michael Bejoy at our community where we stay. Michael essentially was the first person who helped me out when we moved to Kochi after Mummy had passed away. 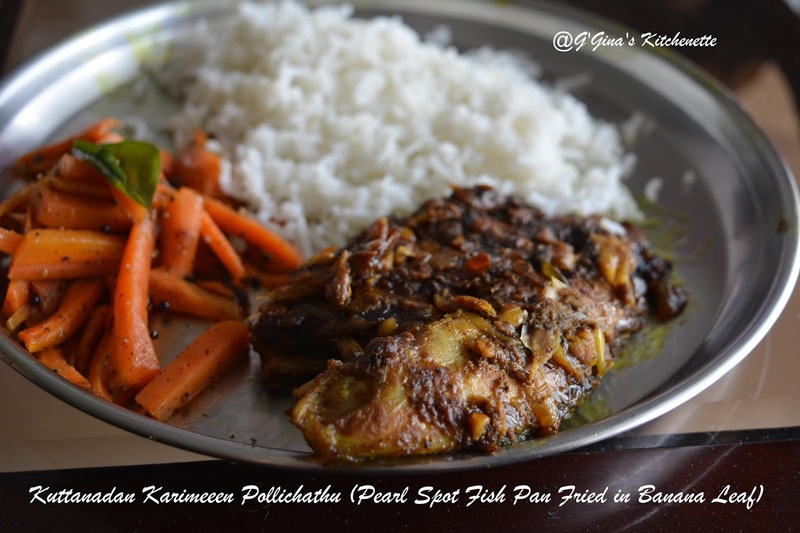 I made the Karimeen Pollichathu in two ways as most of my readers are well aware by now that my little one is anti-spice. We say she is not supposed to have been born into an Indian household owing to her taste buds for non-spicy food. 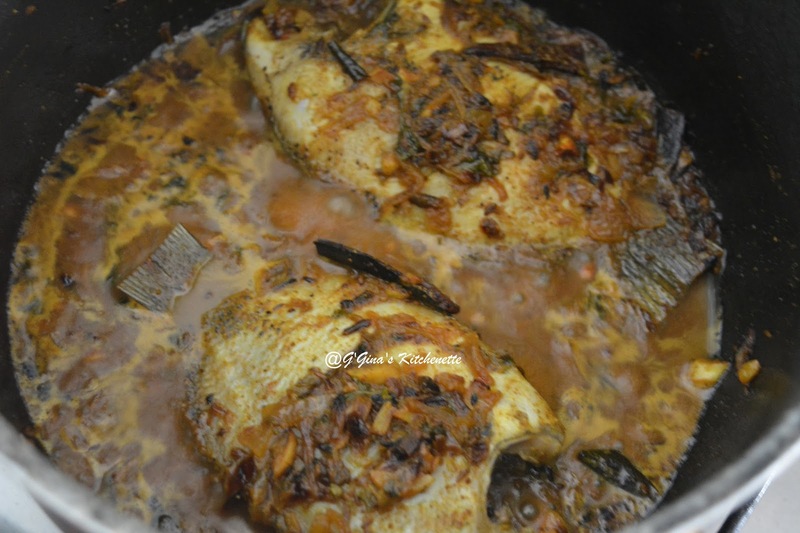 As a result all fish in my home is cooked in two clay pots or pans and so also this one was done the same way. The only difference in the recipe being, I did not add the green chilies or chili powder and substituted the chili powder with coriander powder for my little's one's preparation. She loved it! I did not share this with my hubby as he was traveling all week and by the time he got home quite late that night, he saw only the bones and the leaf in the food trash and one or two last ones refrigerated. He thought I had bought it from this particular hotel. So I am pleased as it looked like one that was professionally prepared by a chef. *happy smiles* :D! I need to make this one more time for him. 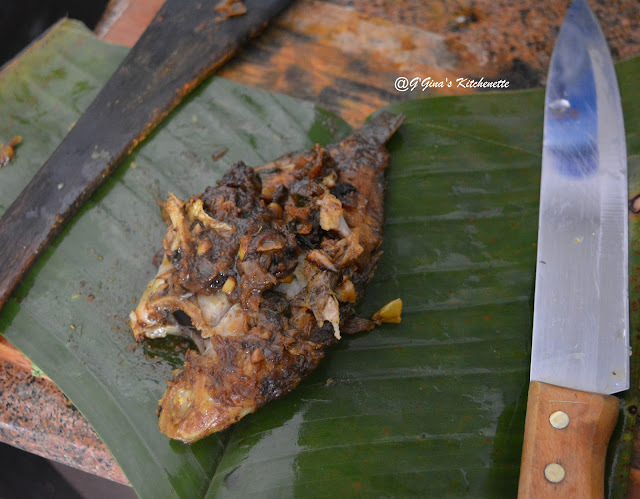 Michael will order another batch of Karimeen soon :)! 1. Drain the fish well before use. 2. Grind the chili powder, turmeric powder, pepper powder and cumin seeds with 1/2 tbsp vinegar to a fine paste. (For the non-spicy version, as mentioned use coriander powder and try to do that as the first grind to avoid the transference of the chili powder spice. If you are making 2 versions remember to divide the quantities of all the ingredients by half or in relation to the ratios in which you plan to make it). 3. In a clay pot or any other heavy bottomed pot(s), heat a little of the coconut oil. Fry the cinnamon pieces in the pan. 4.Add the onions, ginger, garlic and green chilies to the pan and saute it well. Once the onions are cooked well, add the finely ground paste and saute it well in a low flame. 5. Next add the tomatoes until softened and cooked. Add 2 cups of the boiling water to the cooked mixture. 6. Add salt and the remaining vinegar and mix well. 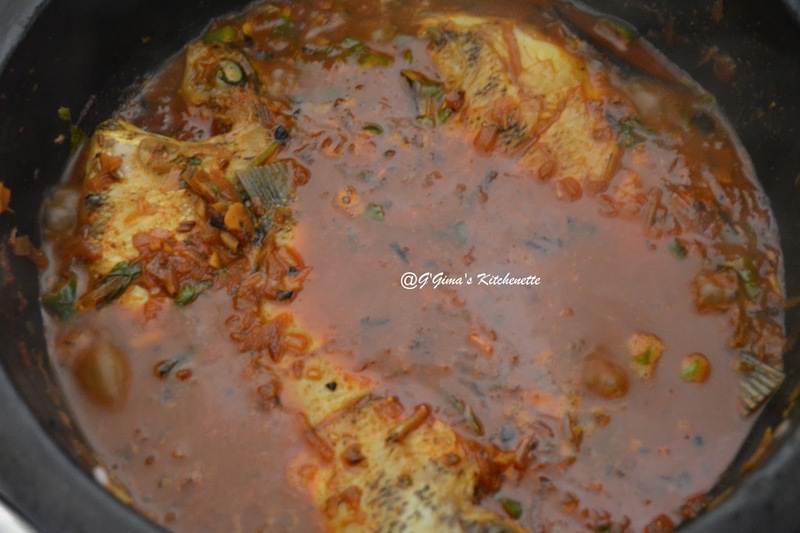 Add the whole fishes to the spices and saute it the gravy thickens and the fish is half cooked which takes about 5-10 minutes. The spices essentially is cooked this way for the Kuttanad version and acts as a marinade for the fish. 7. Each banana leaf can act as a wrap for at least 6 fishes. So using a sharp kitchen knife or blade, slit it vertically into 6-7 pieces and skin off some of the stem from behind the leaf. 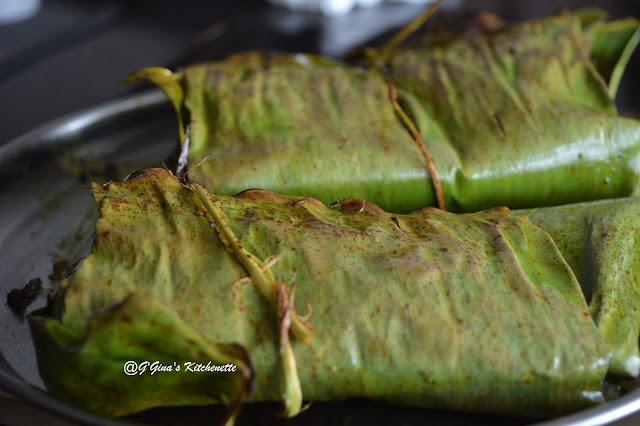 8.Wrap each fish, along with the thickened marinade/gravy in a banana leaf. Secure it with banana fibers(from the banana stem) or a use a kitchen string. 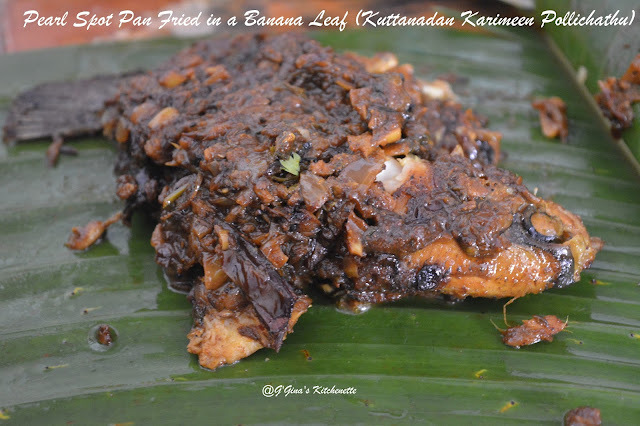 Heat a pan with some oil and pan fry the fish in the banana leaf with 5 minutes on each side. Frying fish in banana leaf give an awesome taste to it.. delicious..
What an amazing and interesting preparation for this fish. 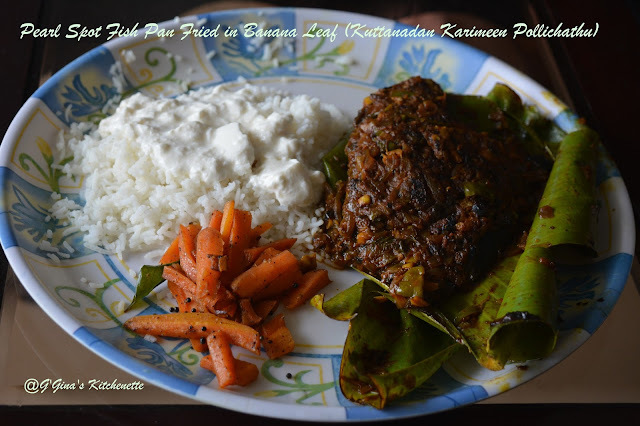 Thanks so much for posting this recipe and all the photos. This looks wonderful! So glad you shared it this month! What a great story. This is a new fish for me! I'm not sure I've even heard of pearlspot. You dish is gorgeous! !